A 1924 film about life, death, identity, and the duties of an assistant librarian, The Late Matthew Pascal, makes its appearance at Anthology Film Archives this Saturday at 3:15. The titular Matthew marries two women, starts his life over from scratch more than once, contacts the spirits, and still finds time to win big at Monte Carlo. The film’s experimental structure puts it in a category with other 1920s films like Dalí and Buñuel’s Un Chien Andalou, though at 170 minutes, it’s something like director Marcel L’Herbier’s 8-course French answer to the Spanish surrealists’ tapas. Moving forward in time just a bit will take you to Gold Diggers of 1933, the quintessential Depression-era Busby Berkeley musical, showing at 1:00, 4:35, and 8:10 Saturday at Film Forum. 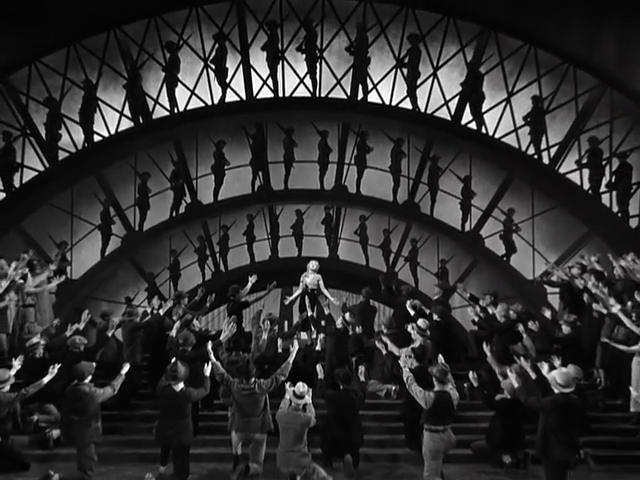 A large cast, including Ginger Rogers, sings and dances its way through what the trailer modestly calls “the show of a thousand wonders,” including, at one point, a performance in front of a wall of fifty-foot silver dollars. Escapism? Of course. But whether you’re trapped in the metaphorical blizzard of a sinking economy, or an actual blizzard, with snow, maybe that’s not such a bad thing. And speaking of escapism, what could be more appropriate—if not, perhaps, more heartening—than breaking the icy bonds of your snowed-in building to take in the story of three men trapped in a warehouse, slowly going mad? Norman Mailer’s Wild 90 is a crime movie without any need to show its audience the crime, in which Mailer himself plays one of three gangsters passing time while hiding from the law. All the dialogue was improvised, with no reshoots allowed: a bold move, but one that seems to have been too much for the critics of the day, who for some reason were not fans of what Mailer later called “the most repetitive, pervasive obscenity of any film ever made.” But this is a new era, and you can judge for yourself at 10:00 PM Sunday, at Spectacle Theater. Written by: Shane Cummerford on February 9, 2013.